It was an unknown wilderness, a forest of pine trees with a carpet of pine needles beneath, located on the east side of the bay. One of the first known white men to have visited the area being missionary-explorer Father James Marquette in 1674. By 1850 settlers began to arrive in Sturgeon Bay and the first home was built in the area. A plat map of the village was made and recorded in 1855. It was then the parcel of land located between Portage Street and Forest Street, fronted by Cedar St. accommodated the establishment called the Exchange which sold fire wood and coal oil. In 1889 a Mr. Cromell purchased this property. He completely remodeled the structure and added a large wing on it to house the magnificent new Hotel Vendome. Ten years later in 1899 this grand hotel mysteriously burnt to the ground. After the clearing of the debris from this parcel of land in 1919 it was called Vendome Park. In a meeting of the city council on June 6, 1922 it was decided to change the name of Vendome Park to Martin Park in appreciation for all the work Mayor James Martin had done in the construction and beautifying of the said park. My cherished memories are of the old Martin Park and its grandeur. The white two-story bandstand with restrooms on the ground floor became the focal point of the community. Memorial Day, Fourth of July were very eventful days with the parade through town ending at the park and with speakers giving an address for the occasions. Election campaigns were no exception with politicians presenting their speeches to an audience wishing to hear their views. In the summer months park benches were assembled in rows in front of the bandstand for the weekly concert. Residents and visitors would gather there to listen to the Sturgeon Bay band on Friday evenings as I recall. Children would be running around playing tag, kick the can, marbles, or other games, and some would be playing on the little merry-go-round swing set southwest of the bandstand. The park provided a wonderful place to have a picnic. Many people working at the cherry canning factory would spend their lunch hour at the park as well as those folks waiting in line with their truck loads of cherries to be weighted and then unloaded at the factory. The round stone fountain fish pond was located in the middle of the park with paths coming from all four corners leading to it. Many people stopped to watch the fish swimming in the pond; some folks trying to identify the species for they were all native fish. It was in 1963 when Fred Peterson offered to build a swimming pool for the people of Sturgeon Bay in the middle of Martin Park. The city council agreed and our beautiful unique little park was destroyed for the pool. My cherished memories of the old Martin Park and its grandeur by far outweigh what it has endured since. The pool needing much repair by 2008 was finally removed and we had a rebirth of Martin Park in 2010 but it’s not the same quaint beautiful little park it once was. 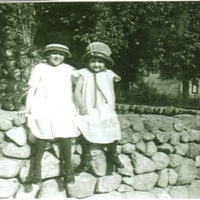 Author's sisters Florence (Jordan) Pagel, 5, and Margaret (Jordan) DeVault, 3, sitting next to a fish pond that surrounded a fountain in Sturgeon Bay’s Martin Park in the early 1920’s. 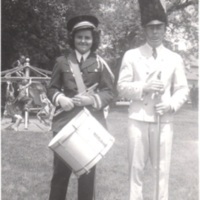 Jean (Jordan) Smejkal with Sturgeon Bay High School band conductor, Mr. W.L. 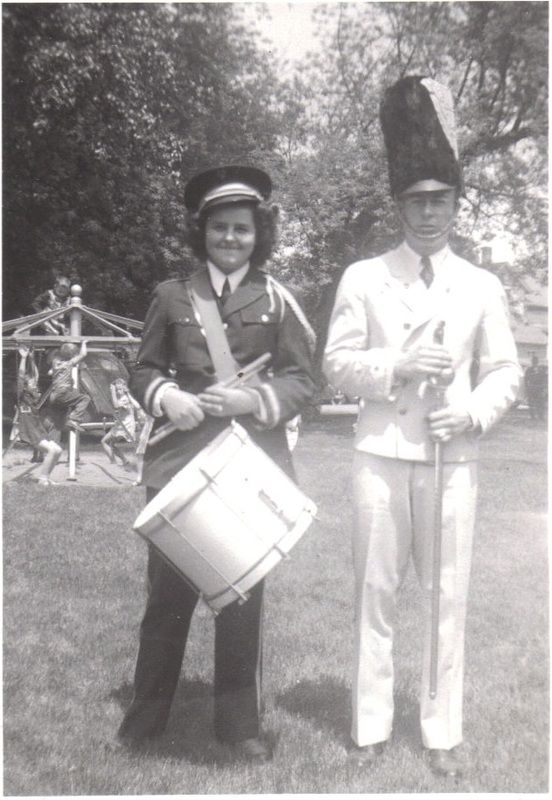 Freeman, after a parade in the late 1940’s. 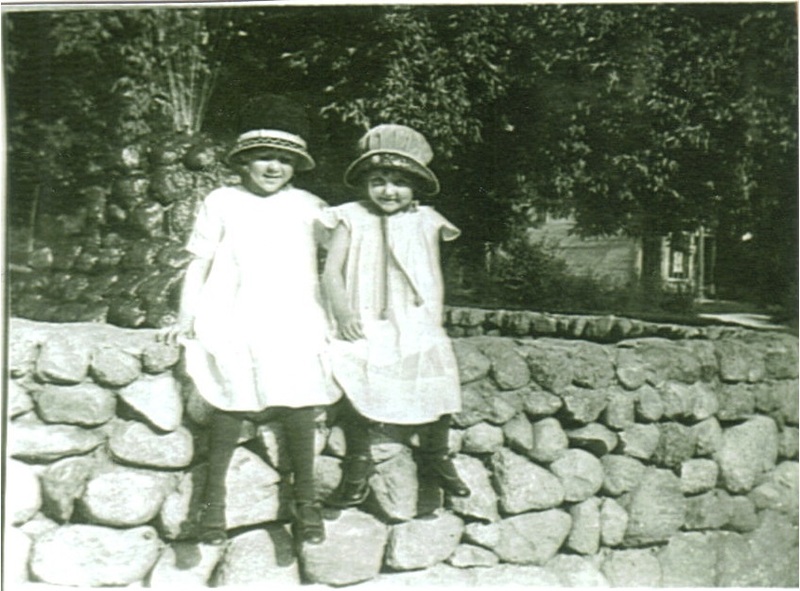 Smejkal, Jean, “The Birth and Rebirth of Martin Park ,” Recollection Wisconsin, accessed April 25, 2019, http://recollectionwi.org/items/show/55.